Philips 47PFL6008 review | What Hi-Fi? It might have its niggles, but we’re willing to forgive them (mostly) for the wonderful picture and comfortable viewing experience. We’re impressed. Philips tends to follow its own schedule when it comes to new TVs, so its sets tend to end up in our reviewing hands later in the year compared with those from rival manufacturers. But this year we’ve been sent one of its 2013 TV sets in time for spring – and we’re glad, because this Philips 47PFL6008 is really rather good. This 47in Full HD, passive 3D LED screen is part of Philips' 6000 series, and features smart content, a new remote control, improved motion processing, and a new Ambiwoox sound feature to match its eye-catching Ambilight tech. It will cost you a cool – but relatively affordable compared with rivals – £1200. This new Philips 47PFL6008 TV looks good: the screen is surrounded by an even thinner bezel than last year’s models, so there’s virtually nothing to distract you from the screen. Build quality is solid too. Yes, the logo might look a bit ‘stuck on’ at the bottom edge of the set and the grey skeletal frame for a stand might look frail, but there’s no reason to worry as everything is sturdy and stable. There’s no unnecessary flashiness here, and it’s to Philips’ credit. Look around to the back panel and you’ll find plenty of connections for your kit: there are four HDMI inputs; an input each for component, analogue audio and RGB Scart; and digital optical and headphone outputs. Those of you with content on hard drives will be glad of the three USB ports, and there’s also an ethernet port and built-in wireless for all your internet needs. And, being a TV, there’s also a digital tuner. There is a satellite input next to the regular aerial socket, but it’s not an official Freesat connection. Philips says that while the TV shares the same specification as the Nordic versions, the satellite option is intended for those countries only. So, while it might pick up some stations over a satellite dish, they won’t be sorted in any order, and are not Freesat compliant. Oh well, Freeview HD it is. Philips has a reputation for making decent remote controls, and the 47PFL6008 sticks to that tradition by supplying a well-made handset. It has a satisfyingly solid weight and a nice rubberised finish that provides a good grip – a nice alternative to the more standard plasticky offerings. The buttons are laid out logically, but a word of warning: the Exit button will take you back to the TV broadcast no matter what source you’re watching – so if you want to close menus while watching a Blu-ray, hit the return button to avoid switching back to TV. Compared with its rivals (such as the Samsung UE46F7000 and Panasonic TX-L47DT65B), the Philips’ reaction times could be faster, particularly when it comes to the Smart side of things – but on the whole, it’s something we can live with. Flip the remote control over and you’ll find a QWERTY keyboard on the back – a new feature for this year’s models. It’s really handy if you browse the internet on your TV; the keyboard style will be more familiar to your fingers, and is a quicker alternative to plodding through on-screen keyboards using the up and down buttons. Search results come up pretty quickly as well, and it’s one of the few times we’ve actually enjoyed browsing the web on a TV. There’s no separate minimalist touch-pad remote control (fast becoming a standard addition to smart TVs) here, but there is a free control app that you can download on to your smartphone and/or tablet. Philips MyRemote is compatible with both iOS and Android, and the tablet version includes a full TV programme guide. The control app is functional, logical and responsive, and a nice alternative if you find swiping across a touch screen more intuitive than clicking buttons. It even displays the programme you’re watching, and you can also send media (photos, videos, music) stored on your device directly to the TV using the SimplyShare feature. Press the ‘Smart TV’ button on the remote and Philips’s one-page hub shows up. While it doesn’t have the breadth of apps and content freely supplied by rivals, it does have the essential BBC iPlayer, along with Acetrax, Facebook, Twitter, Blinkbox and Absolute Radio. Meanwhile, the App Gallery contains widgets for eBay, TED talks, various radio stations and more. Also new to the TV is Miracast capability, which mirrors media content from your smart devices to the TV via wi-fi. Smart features have grown in prominence over the past few years, so much so that they’ve now become an essential part of TVs, rather than just add-ons. Next to the shiny new interactive and user-friendly hubs offered by Samsung and Panasonic, the Philips interface does look a bit dated. It’s perfectly functional and we do appreciate the neat, simple menus over anything showy or gimmicky, but it’s not as engaging an experience as it might be. We’d like it to be a little smoother and faster, too; as we mentioned earlier, the apps are rather slow to navigate and open, which could get frustrating if they’re used on a daily basis. We've long bemoaned the sound quality of modern TVs and it seems that in 2013, manufacturers are finally doing something constructive about it. The 47PFL6008 features Philips-patented ‘Ambiwoox’ technology: look to the back of the TV again and you'll see a driver right above the connections. This Ambiwoox driver, with its double suspension ring, aims to deliver greater bass extension and improve midrange performance. It certainly adds extra oomph: regardless of source, the Philips sounds solid and well-rounded, with good weight across the frequencies and none of the harsh, tinny brightness we’ve come to expect in voices. It wouldn't hurt to invest in a decent soundbar to get an even better sonic experience but, as it stands, we were comfortable listening to the Philips on its own. One thing we’ve always liked about Philips TVs is the Ambilight feature, designed to decrease eye fatigue and increase the immersiveness of the picture. The tech uses a series of LEDs at the left and right edges of the TV panel to shine light on to the back wall – light that changes colour according to the image on the screen. It sounds cool, and looks even better. With it switched on, the barely there bezel seems almost to vanish, while the image appears to extend beyond its own edges – and rather than being showy or distracting, as you might expect, it’s remarkably unobtrusive. You can adjust the intensity and brightness of the colour, set it to a static colour or to Dynamic (we prefer this option – it’s the one that changes with the picture), and you can also pick your wall colour from a palette to fine-tune the effect to your surroundings. Simple, but effective. Of course, neither the sound nor the Ambilight feature would be worth their salt if the 47PFL6008’s picture wasn't any good. But there’s no need to worry: this is a great screen. A quick comparison with last year’s Award-winning Sony 46HX853 shows that the Philips delivers crisp, clean and detailed images. It isn’t a better picture overall (the Sony is smoother) but it’s definitely sharper and more detailed. Whites and highlights are clean and punchy too, and blacks are deep enough – but not as definite in subtle shadings as rivals such as the Panasonic TX-L47DT65B. Switch to a DVD of Seven Psychopaths and the Philips shows itself to be a fine upscaler – there’s an inevitable drop in quality from Blu-ray, but it retains the clean picture and brightness. Whatever the source, the Philips’ colours are dynamic and have a good natural balance overall, even if they’re slightly on the cool side. There’s no compromise when it comes to detail or texture, however: it’s merely a colour characteristic that shows up particularly on skin tones, which tend towards a cooler palette rather than a robust, blushing one. A little colour boost and few steps towards the red side of the R/G tint scale livens things up a bit. On that note, there’s plenty of scope to tweak the 47PFL6008’s picture. You can delve into the menus to choose a picture style (we liked Personal or Standard the best), while there’s plenty of scope to adjust factors such as brightness, contrast and backlight. 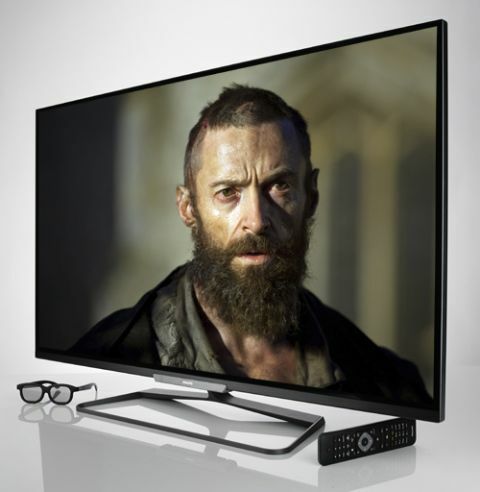 We’d recommend using a THX Optimizer disc to get the TV looking at its best when watching Blu-rays. You’ll have to calibrate each HDMI input separately, however – which is a bit laborious but worth it in the end. It’s also a shame that you can’t tweak broadcast TV to the disc-based THX standards – although if you run all your sources through an AV receiver, you’ll only be using one input anyway, and all this is a moot point. Anyway, whichever way you do things, a bit of tweaking sees standard and high-definition TV channels look dynamic, natural and noise-free. Motion processing rate has gone up to 500Hz from last year’s 400Hz, and there’s a subtle, but significant difference. The picture is smooth and assured, both in slow pans across the screen and in fast-moving action shots. We played around with toggling Perfect Natural Motion off and on Minimum, but in the end we left all options (under the Pixel Precise HD section) switched off, as any additional processing tends to give a somewhat unnatural sheen to the picture in an attempt to smooth things over. Play TT3D: Closer to the Edge in 3D, and you’re in for a smooth (if adrenaline-charged) ride. Philips’s passive 3D tech is some of the best we’ve seen – it might even give Panasonic’s passive 3D LED sets a run for their money. It puts hardly any strain on your eyes and despite the usual dimming when you put the glasses on (there are four pairs in the box), the picture remains crisp and bright with a good depth of field. The smooth motion-handling is certainly evident here; we’d happily watch 3D films on the 47PFL6008 TV. If you’re a fan of two-player gaming, the 3D technology has a neat trick up its sleeve. It works to give each player a full-screen experience instead of splitting the screen in half (as it would in normal 2D). You’ll need to buy separate 3D gaming glasses (two pairs cost about £30), so each player can see their own game in full screen while playing at the same time. There’s no denying it: this Philips TV holds its own comfortably against pricier class rivals. There are downsides, though, which explain its four-star rating. There's the slight sluggishness during use – we’d have liked it to be much more responsive. A dash more subtlety across the board in picture quality would help too, as the competition from rivals is sky-high as far as we’ve seen in the new 2013 sets. That being said, this Philips 47PFL6008 TV is one of the best four-stars we’ve given in recent times. It might not have extensive smart features or a fancy interface, but if all you want is a big screen with brilliant picture quality and easy-on-the-eyes 3D, the 47PFL6008 is excellent value for £1200.